A woman who became trapped inside a clothing donation bin in Miramichi is safe after she was rescued by a police officer. 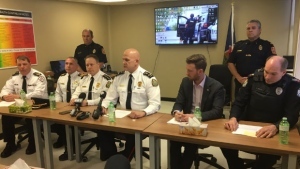 The Miramichi Police Force said a Facebook post that the officer was driving past the Lord Beaverbrook Arena around 3:30 a.m. Monday when he glanced at the clothing donation bins at the edge of the parking lot. Police say the officer thought he saw the metal flap on the bin’s opening move, so he stopped his cruiser and went to investigate. The officer found a 60-year-old woman inside the clothing bin. She told the officer that she had crawled into the bin to escape the storm, but she became stuck and couldn’t get out on her own. She said she had been inside the bin for a few hours. Police say the woman was very cold, but was otherwise OK. The officer then drove the woman to a home. 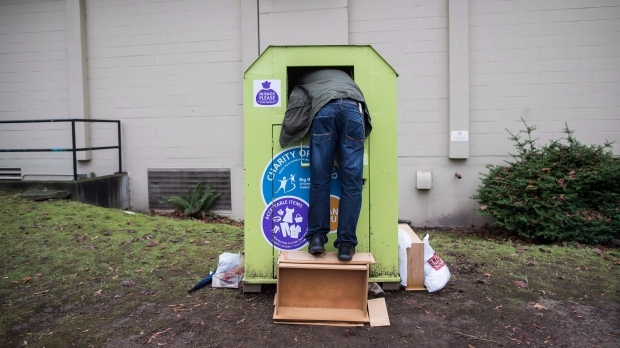 The incident comes after the recent deaths of two people who became trapped inside clothing donation bins in British Columbia and Ontario. A 34-year-old man died on Dec. 30 after crawling into a bin in West Vancouver, while a 35-year-old woman died on Jan. 8 in Toronto. There have been at least eight deaths related to people attempting to get inside clothing donation bins in Canada since 2015. The issue has raised questions about the designs of the bins, and whether there is a way to make them safer. The manufacturer of clothing donation bins used by charities across Canada has stopped producing the metal containers, which were involved in the two recent deaths, while it works on coming up with safer designs. RangeView Fabricating, a Toronto-area company that produces bins used by prominent charities such as Diabetes Canada and B'nai Brith, said it is now focused on modifying the existing bins to improve safety.